I am part of a Zentangle Group on the Chocolate Baroque Ning Forum where we have a periodic challenge or task. Our first was to use a "Z" string as the basis for the tangle & the current one is to make a traditional Zentangle sized tile using the TanglePatterns String 010 from Linda Farmer's TanglePatterns.com. One of the good things about making blog posts is that you can see how you develop as time goes by - at least when it comes to artwork you can - sometimes it will take months, sometimes a matter of weeks or even days. As I wrote about the possibility of preferring the creamy colour of watercolour paper to the white of the W H Smith 220gsm White Card when used with the black pen I had no idea it would actually occur within a fortnight. 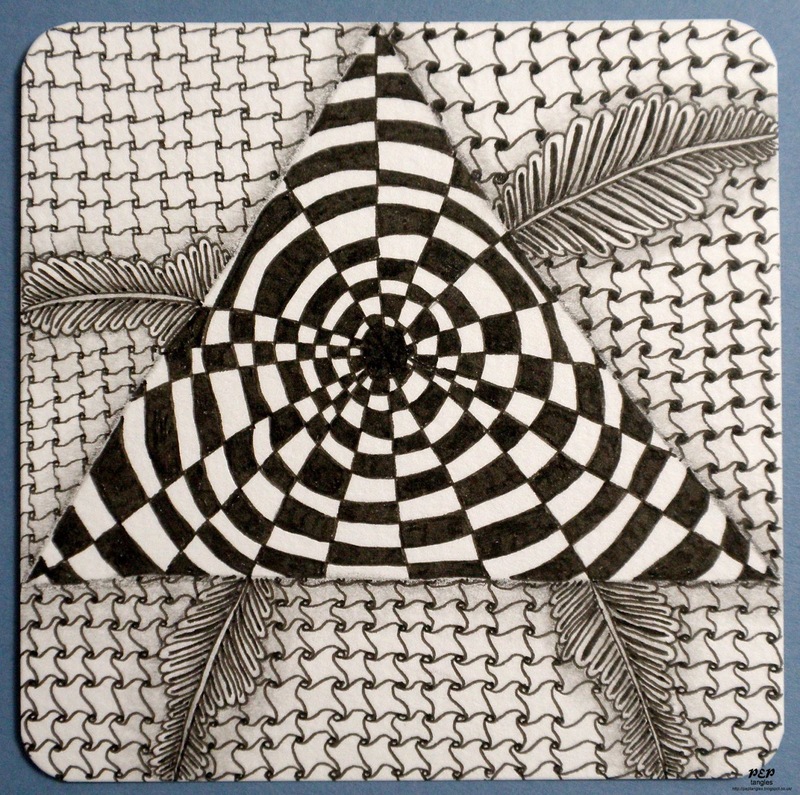 Since that is where I find myself now I've made some 3½ inch square tiles from the Winsor & Newton Cotman Watercolour Paper 190gsm Cold Pressed/NOT Grain Fin rounding the corners with a Woodware corner rounder punch (the traditional Zentangle Tiles have rounded corners) as I find this adds to the finish. I initially thought that using a black Polychromos pencil for shading might be a good idea but soon discovered that the effect was too dark. I found this post mentioned using a 2B pencil & managing to buy a 2B Lakeland Graphite locally I used that with a paper stump for the shading on this tile. The whole 'feel' of the watercolour paper with the smoothness of the graphite is quite delightful & hard to describe, just a joy. My three background tangles are all Cadent with slight variations & the strings within the triangular shape became part of the Twilight Zone tangle. wow! !...a really eye-catching, graphic piece!! very dimensional and has a bit of movement...looks like a lot of work-- really beautiful! ps...loved watching twilight zone with my dad when i was little...very fitting reference for the project:). This is beautiful Paula, you have used two tangles that I have never tried, just love 'frond', must try it. Your shading is superb. Thanks for the tip about the 2b pencil. Off to add my efforts to the CB site. Totally stunning work Paula, black and white is always striking, but this piecer really is a work of art. This is a great way of interpreting this interesting string and I love the curvy fronds breaking up the geometric designs. Cadent is one of my favourites but I struggle to make it as beautifully even as you have - nice variations in the different areas too. Wow Paula, this is stunning. I love the combination of designs and the dimension you've achieved. This really is a perfect art for you, its so creative, yet organised and also fluid at the same time. I am your biggest fan of this stuff! :) Fabby! Fabulous work Paula, love how you have used the fronds to break the sections up. Cadent is one of my favoutite patterns, I love how it creates waves, and you have used it to great effect here. The 3D nature of your piece is so effective, really clever. I have been using a very soft pencil myself, I can't remember what it is, but I'm sure it is at least 2B if not softer. I have a big range from my Art class days.